When you were eight, going to a pool party meant packing your favorite water wings, some shorts, and maybe a bottle of SPF 45, if you had one of those moms. And while sunscreen is still never a bad idea, you know that pool parties for adults often mean world-class DJs, bottle presentations and gorgeous models. DAYLIGHT Beach Club at Mandalay Bay Hotel in Las Vegas exceeds every expectation imaginable when it comes to day/pool parties in Vegas. 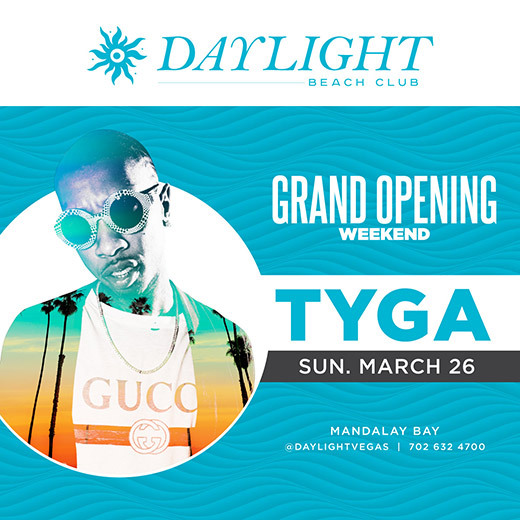 This year, internationally acclaimed rapper Tyga is this year’s DAYLIGHT Beach Club’s resident. Kicking off Las Vegas pool season on March 26, Tyga is bound to put on an unforgettable performance. DAYLIGHT boasts a luxurious 5,000-square-foot pool, an elevated stage with unobstructed, private daybeds and VIP cabanas, and so much more to fulfill your weekend getaway this pool season.